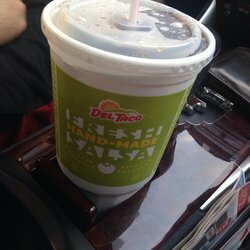 This Coke Zero I got at the Del Taco drive-thru tastes more like root beer than any other Coke Zero I’ve ever had. Possibly the guy in front of me or behind me is wondering right now why his root beer tastes like Coke Zero. Note to self: In future visits to fast food drive-thrus, take a sip of the drink before driving off with it. Bright Side: At least you got something close to what you ordered! For example, you didn’t get rubber chicken instead of, presumably, a taco.